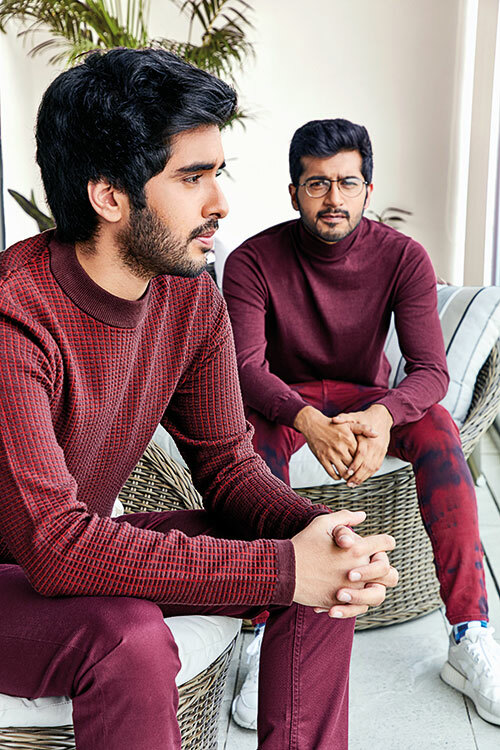 On Nakul: knitted jumper, from Massimo Dutti; jamdani cotton pants, by Suket Dhir; wristwatch, sneakers, both Nakul’s own . 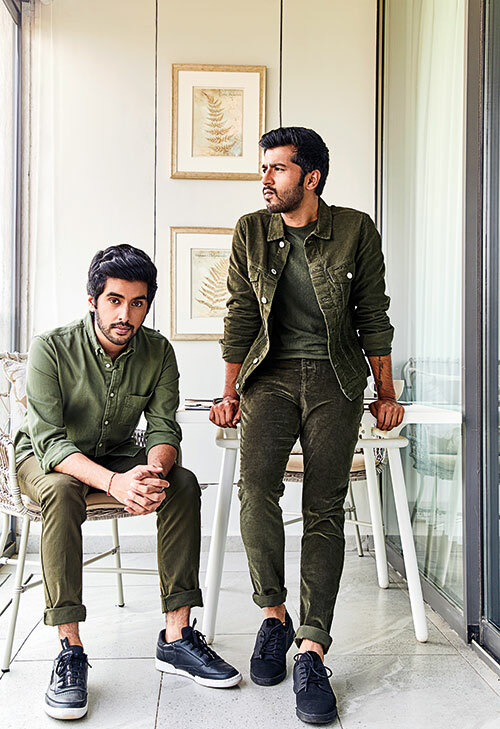 On Sahil: jacket, from Jack & Jones; cotton trousers, by Suket Dhir; sneakers, Sahil’s own. A lot of us have, at some point in our youth, had Utopian fantasies about starting up a venture with our best friends. And there are the ambitious few, who power through the commotion and actually see their dreams come to fruition. 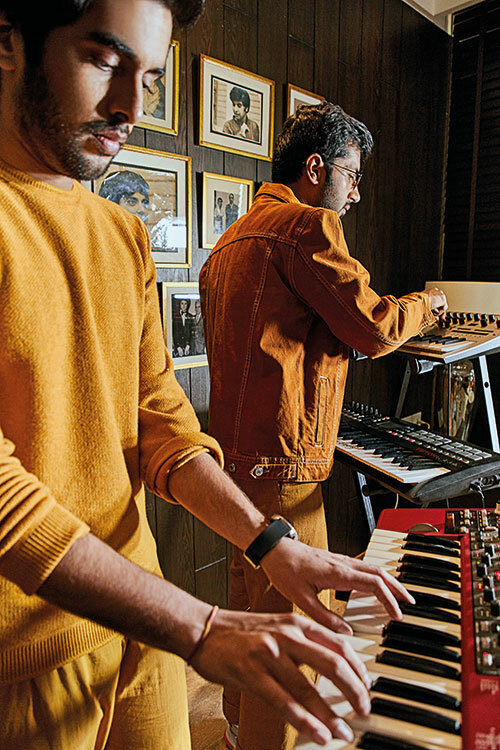 Take, for example, Nakul Sharma, 26, and Sahil Bhatia, 28 — the two faces of Mumbai-based electronic band Burudu. Having met at Kingston College, London, in 2012, they soon discovered their mutual passion for music and founded the band a year later. As college-goers, they would upload their music to SoundCloud, and that’s where record label Seamless Recordings noticed them, soon handing them their first EP, Sun Theory. Encouraged by the response to their music, the boys continued creating strong tunes, hoping that they could convert their passion project into something big along the way. After finishing with college, the two friends went in different directions — Sharma returning home to Mumbai and Bhatia, New Delhi — and so, they had to overcome the hassles that come with any long-distance relationship…not to mention the frustrations that come with internet connections that were agonisingly slow for their needs. Still, they would exchange music and offer feedback to one another over multiple Skype sessions. 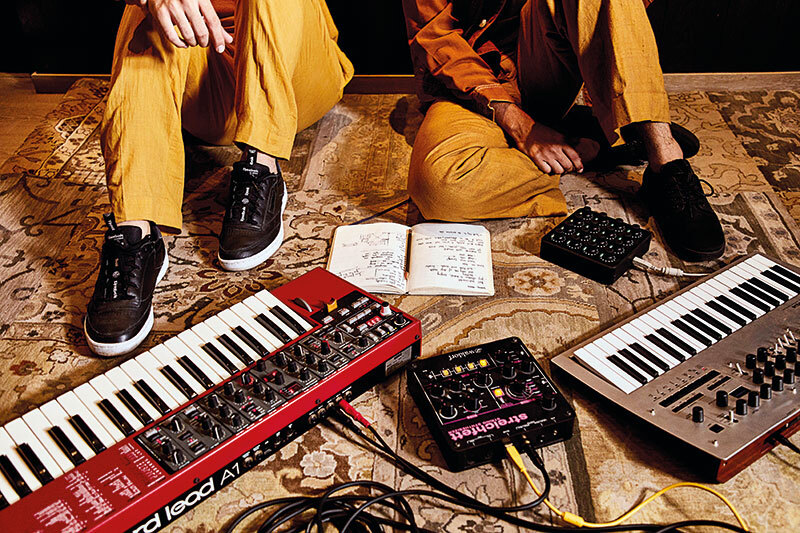 Soon enough, their distinct electronic beats — often interspersed with orchestral elements and modern synths — saw them performing at festivals such as Magnetic Fields (in 2016), Ziro Festival of Music (last year) and La Isla 2068 (earlier this year in Mauritius). More recently, they performed with a live band at Flea Bazaar Cafe in Mumbai and Bacardi NH7 Weekender in Pune. As the Burudu boys get ready to release new music in the near future, it’s worth listening to their debut album Ditties that they released last year. It features a number of collaborations with both national and international artistes, and unique tunes that range from German pop and Creole rap to Hindustani ragas. And it is in this ability of theirs to be innovative, experimental and unafraid to push the musical envelope that their inherent appeal lies. On Nakul: jumper, from Selected Homme; chinos, from Massimo Dutti. On Sahil: turtleneck, from Massimo Dutti; denims, stylist’s own. On Nakul: shirt, chinos, both from Zara. On Sahil: knitted jumper, from Zara; corduroy jacket, pants, both from Jack & Jones. 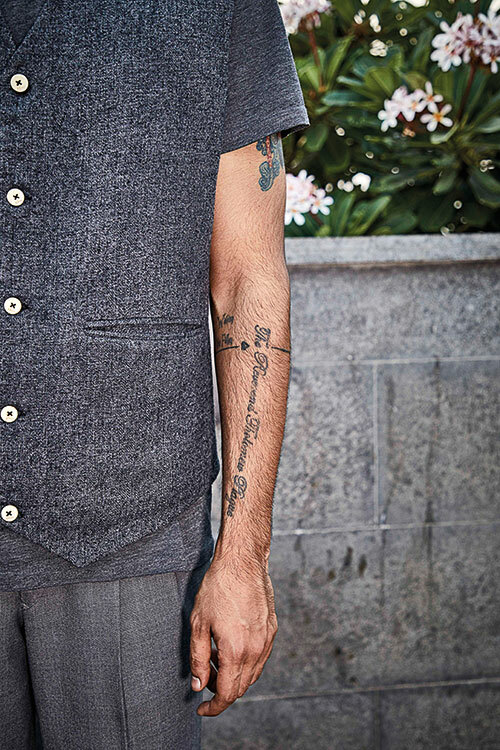 On Sahil: woollen waistcoat, from péro by Aneeth Arora; shoes, from Adidas Originals; T-shirt, trousers, both stylist’s own. On Nakul: woollen jacket, from péro by Aneeth Arora; trousers, from Selected Homme; shoes, from Adidas Originals; shirt, Nakul’s own.